The aim of the Jumbo Joe, was to create a fun, portable grill for the campsite, and typical of Weber, they chose not to completely re-model, in favour of using the excellent features they already have on other grills, with a few adaptations of course. 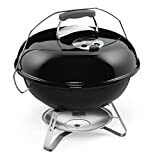 It’s aimed at grill enthusiasts from novice to expert, who like portability, but want something more advanced than most portable grills, and want a slightly larger grill to cook on. Did they succeed and make it to the list of the best portable charcoal grills? This Weber 1211001 Review will inform buyers as to whether or not, they achieved this. Weber have taken the exact bowl design used on their range of Kettle Grills, reducing it to 18 inches, while removing the legs and wheels. Losing the wheels actually makes the unit more steady, and the steel construction will be durable. The steel is also rust-resistant and the vents can be tightened, which is great when moving the grill around. Measurements are 50.2 inches of length, by 50.1 inches of width and the height is 50.1 inches. The weight is 8kg, which is low enough, to claim portability, and to not be any kind of strain on the arms when transporting the grill. The only problem I have with the design, is that the lid isn’t hinged well, although Weber are working on this. Assembly is pretty straightforward, despite the manual and its rather annoying attention to detail (a huge section on screw heads when only one type of screw head is needed). Buyers will be assembling for just under 15 minutes, with the ash pan being the most difficult part, although none of this can be described is supremely difficult. The 1211001 has a very similar performance to the Weber Original Kettle Grill, because they’ve used the same bowl design. You’ve got steel grates, which are good, but not as good as cast iron grates at retaining heat. Consequently, food would be less evenly cooked, if it where not for the excellent air-flow system inside the specially designed bowl. The bowl allows air to move freely, around the cooking area, so despite not having cast iron grates, buyers get wonderful evenly cooked food. Next I want to talk about the size of the cooking area, which is nothing short of exceptional for the price. There are 240 square inches of cooking surface, which is significantly more than other portable grills and the gap between the lid and the grates is 4.5 inches. So cooking for 8 or 9 people is not a problem, and as with the Original Kettle, the 1211001 grills everything to an amazing standard. Its good to see they kept the same handles as the Original Kettle, as these where very heat resistant and the glass-reinforcing was a welcome enhancement. There’s no thermometer, so each individual buyer will have to decide whether this is a problem or not, the room under the lid is incredibly tight so I’m not sure where Weber would have fitted one anyway, even if they had been inclined to include one. With porcelain-enamel coating, the Jumbo Joe 1211001 is easy to clean, and needs just a wipe across the non-stick surface, although the lid retainer does rub a little, against the coating. 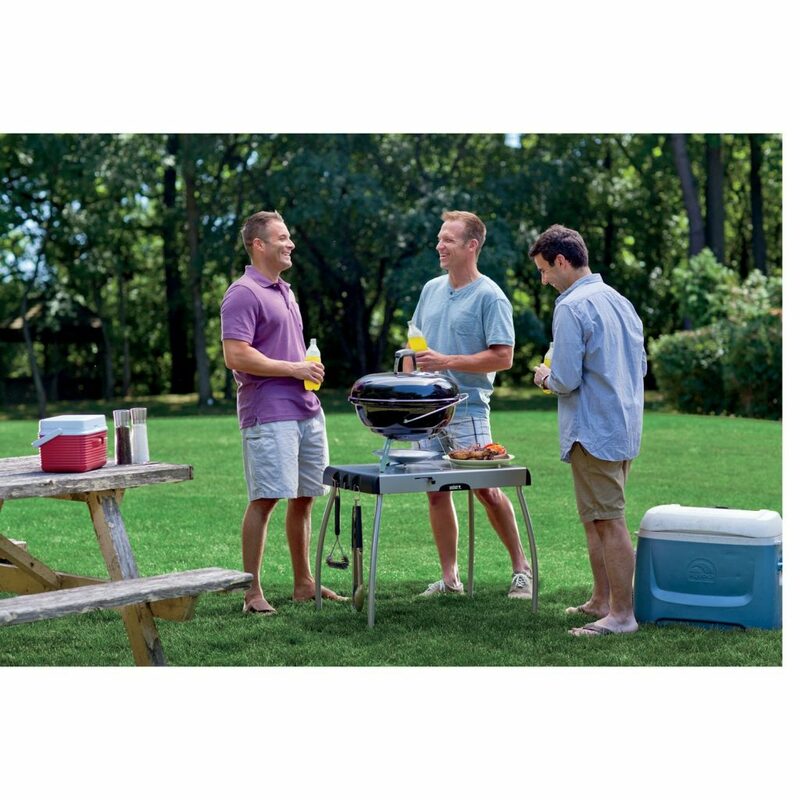 Priced at around $110, the Jumbo Joe is an affordable portable option for grill enthusiasts, who want a large grilling area. Weber’s bowl designs always produce wonderful food, so although I prefer cast iron grates, I can’t argue with the taste. It’s small enough to be considered portable, is very easy to assemble, and its weight makes the 1211001 easy to carry around. Weber set out to make a fun grill for camp sites, and they succeeded in this. Think of the Jumbo Joe, as a more portable version of the excellent Original Kettle Grill. Comes highly recommended.